Nutritional disorder – sulfur (S) deficiency. 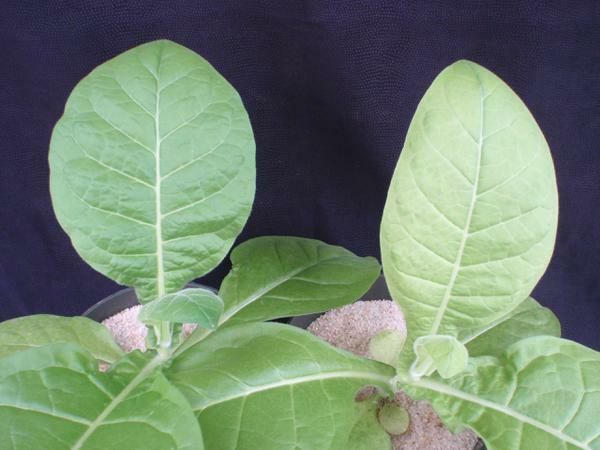 Sulfur deficiency in tobacco begins as an overall chlorosis of the foliage (Figure 1). This symptom differs from nitrogen deficiency in the fact that the yellowing begins in the central foliage and works its way up the plant (Figure 2). The chlorosis that occurs with nitrogen deficiency starts distinctly on the bottom foliage and symptoms progress sequentially up the leaves. The first step in distinguishing which nutrient is scarce, is to identify where the chlorosis is on the plant. As sulfur deficiency progresses, symptomatic leaves become more chlorotic, and the chlorosis spreads throughout the foliage (Figure 3). These intermediate symptoms may include a mild stunting when compared to a healthy plant, but this stunting is not nearly as prominent as with nitrogen deficiency. It becomes easier to distinguish between sulfur and nitrogen deficiency symptoms as the symptoms reach this intermediate stage. Sulfur deficiency is accompanied by a vibrant and uniform yellowing, while nitrogen deficiency symptoms display a lighter, bleached yellowing that is more pronounced on the lower leaves. Advanced symptoms occur on nearly all of the vegetative tissue, including the stems. This overall chlorosis may be observed in the 360-degree image below (Figure 4). Figure 1. The initial symptoms of S deficiency include an overall chlorosis of the center foliage. These symptoms may be compared with the healthy plant on the left. Figure 2. The symptoms of sulfur deficiency can be seen moving up the plant from the center foliage. This may help to distinguish between sulfur deficiency and nitrogen deficiency, which occurs first on the lower foliage. Figure 3. The intermediate symptoms of sulfur deficiency may be seen here in the form of overall chlorosis. Figure 4. The 360-degree view of this symptomatic plant with a severe sulfur deficiency may be viewed by clicking on the above picture. Nitrogen (N) deficiency also results in lower leaf symptoms, but in the case of limited nitrogen, the pale green to yellow leaves begin at the bottom of the plant, as compared to a sulfur deficiency which initially begins in the middle of the plant. Tissue analysis for nutritional concentrations can assist with a correct diagnosis. Sulfur is typically found at higher concentrations lower in the soil profile or closer to the B horizon; therefore, as root growth reaches the clay layer sulfur should be found in greater supply. Sulfur (as sulfate, SO42-) is very mobile within the soil profile, specifically when soils are dominated by sand or large soil particles. Burley. 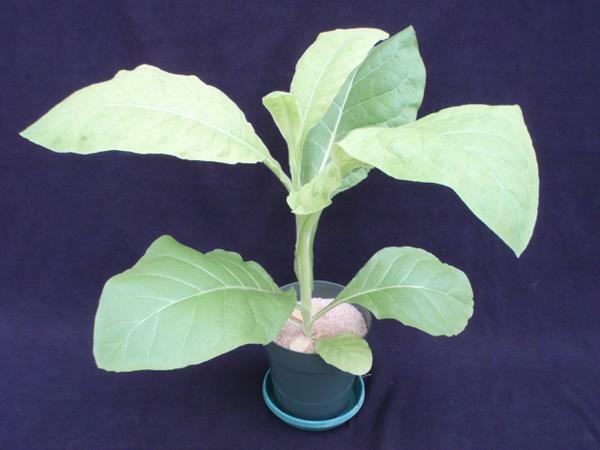 The sulfur sufficiency range for burley tobacco is similar for all growth stages (seedlings, early growth, flowering and maturity): 0.15 to 0.6%. The range is based on sampling the most recently mature leaves. Flue-cured. The recommended ranges for flue-cured tobacco vary by the stage of development. The ranges based on the most recently mature leaves are: seedlings early growth, flowering, and maturity are all at 0.15 to 0.6% sulfur. At harvest, sufficiency ranges for sulfur are at 0.14 to 0.4% sulfur (upper leaf, middle leaf, and lower leaf). There are no published recommendations for excessive sulfur levels. Managing sulfur deficiency is commonly made possible through the application of sulfate of potash (0-0-50) or Sul-Po-Mag (0-0-22). Much like potassium, sulfur deficiency is much easier to address prior to layby when sidedress applications of these fertilizer sources can be efficiently delivered to the crop. It is recommended that 100 to 150 pounds of 0-0-22 or 0-0-50 be applied to address sulfur deficiency. Some nitrogen materials, such as ammonium sulfate (21-0-0-24S) and urea-ammonium-nitrate (28-0-0-3S), contain varying amounts of sulfur and can be applied if nitrogen is deficient as well. Producers are strongly encouraged to ensure that nitrogen is required prior to applying a N-S containing material, as excess nitrogen will only further complicate management. Seedling Production. Sulfur deficiency is sometimes observed in the float system when the soilless substrate was not supplemented with magnesium sulfate (Epsom salts) or calcium sulfate (gypsum) and sulfur was not provided by the fertilization program. Media sources and fertilizer blends designed for tobacco production should contain adequate amounts of sulfur, so this is not a common issue. If a deficiency is confirmed Epsom salts can be added to the floatbed at a rate of 4 ounces per 100 gallons of float water. Epsom salts should be added to a bucket of warm water, mixed thoroughly, applied in numerous places around the bed, and then circulated around the bed. Sulfur deficiencies are most likely on deep, sandy soils (more than 15 inches to clay) that are low in humic matter (less than 0.5 percent). Because sulfur easily leaches, deficiencies are more likely in these soils following heavy rainfall in the winter and spring, especially if sulfur is omitted from the fertilizer of the next tobacco crop. Symptoms of sulfur deficiency are very similar to (and are often mistaken for) symptoms of nitrogen deficiency. When a plant is low in nitrogen, the lower leaves are paler than the upper leaves and “burn up” prematurely. However, sulfur deficiency begins as yellowing in the buds; the leaves gradually pale from top to bottom, and the lower leaves do not “burn up” prematurely unless nitrogen is also deficient. Because sulfur is required for nitrogen use in the plant, adding high rates of nitrogen to sulfur-deficient crops will not turn the crops green, and can, in fact, reduce leaf quality. Therefore, accurate diagnosis of the deficiency is very important and often requires tissue analysis. Soil tests for sulfur are sometimes unreliable. Therefore, to reduce the chance of sulfur deficiency on deep, sandy soils, add 20 to 30 pounds of sulfur (S) per acre from the N-P-K fertilizer every year. Sulfur deficiency occurring before layby can be corrected by banding 100 to 150 pounds of Sul-Po-Mag or potassium sulfate (0-0-50) as soon as possible after the deficiency is identified. However, sulfur deficiency on soils less than about 12 inches to clay is often temporary, even when no extra sulfur is applied, because adequate sulfur is usually contained in subsoils and will be absorbed as roots reach this depth.